As I prayed and prepared for our Mass this afternoon, and for preaching on Luke 24:13-35 I continued to ponder on Jesus’ words to those disciples on the road to Emmaus who did not really know who he was until he broke the bread with them. In my sermon entry I made the points that they really did not know him, that is they “didn’t get” him, and they did not expect him on the road. I also used the Peshitta translation (closest to Jesus’ Aramaic) for Jesus’ strong response to Cleopas and his companion: ” Dull-minded and heavy-hearted”. The Message translates the same words: “So thick-headed and slow-hearted”. However they are translated they are a strong response to having had the opportunity to know Jesus and yet not knowing him at all. I saw the moving and poignant HBO documentary “Valentine Road” last night. It is about the killing of an openly gay biracial 15 year old(Larry King) in a Middle School in 2008 by a 14 year old fellow student (Brandon McInerney). Both students came out of violent backgrounds where mothers were addicted to drugs. Larry, who had been adopted and lived now in a Group Home, was fighting for his identity and courageous enough to be who he was in a hostile environment. Brandon who was approached publically by Larry asking for a date, thought it was perfectly right to kill Larry. He announced this ahead of time and he carried it through. Brandon also had affinity for Hitler and for a local White Supremacy group. This was clearly a hate crime, and, because both were children, a particularly sad and outrageous crime. It became a hallmark case against bullying in schools. One of the most upsetting scenes in this very well done Documentary was that of a teacher who, self-righteously, with the Cross on her living room wall prominent in the background condemned not the perpetrator but the victim of this horrendous crime. And another unbelievable scene was when several of the jurors got together after a mistrial and did the same. I thought “dull-minded” and hard -hearted and “thick-headed and slow-hearted”! I wanted to say to them: the Cross should be in this picture only because Larry was hung on it-don’t you get who Jesus was? Jesus loves Larry-and all who are outcast by the self- righteousness of narrow minded Christians who want to follow Christ, but just can’t see who Christ is. I did not consciously know I was on the LGBTQ spectrum until age 30, but had I known, that could have been me! And such horror stories happen every single day to people who are different in orientation, and in many other ways. Here is another meditation on the same problem by Bob Shine of Newways Ministries blog. com and following this is a wonderful reflection by Dan Clendenin on similar musings on the Road to Emmaus. The criminalization of homosexuality has been a disturbing trend around the globe, as nations strengthen or add laws discrimination against LGBT people. For Cathholics worldwide, there is the concurrent reality that prominent Church leaders and Catholic politicians have openly supported, or even actively pursued anti-gay legislation. Incidents in Liberia and Zimbabwe further raise these concerns, and are evidence of why it is so important for Pope Francis to defend LGBT human rights explicitly. A bishop in Uganda was not the only clergyman who used Easter to condemn LGBT people. A report from The Advocate says a priest in Liberia priest used the feast day to attack marriage equality and the nation’s president, who has not denounced same-gender marriage. Fr. Ambrose Kroma said President Ellen Johnson-Sirleaf’s silence on the marriage issue, which is illegal in Liberia along with homosexuality in general, is evidence of her support for LGBT rights. His comments follow-up on Archbishop Lewis Zeigler of Monrovia’s comments against same-gender marriage in April. In Zimbabwe, President Robert Mugabe, who is Catholic, called homosexuality “inhuman” at an event celebrating Zimbabwe’s independence, according to New Zimbabwe. He also threatened organizations seeking LGBT equality in the country and said he would expel foreigners supportive of gay rights, adding to his viciously anti-LGBT record. In his comments, he appeals to God and Christian faith as justifications for his opposition to homosexuality. According to the Washington Blade, groups in Zimbabwe claim the dictator uses anti-LGBT rhetoric to shore up political support. With news that Uganda’s President Yoweri Museveni has gained popularity since passing that nation’s harsh anti-gay law, it seems likely that scapegoating LGBT people is a successful political tactic into which Mugabe is tapping. A good first step is participating in the #PopeSpeakOut campaign, to make your voice heard in Rome and elsewhere for Pope Francis to clearly condemn laws which encourage discrimination and violence against LGBT people. You can find more information on how to take action by clicking here. In his book The Mind’s Eye (2010), Oliver Sacks explores how the plasticity of the human brain compensates for different types of blindness. As in previous books likeMusicophilia, Sacks weaves together clinical anecdotes from his practice as a neurologist, letters he’s received, scientific studies, memoirs by blind people, and the results of brain imaging techniques. His longest chapter includes entries from his personal journal about his own experience of ocular melanoma. Sacks explains how people can be blind in different ways and for different reasons, from birth defect, accident, injury, or disease. Lilian developed “visual agnosia” late in life. She could recognize the tiniest letters on an eye doctor’s chart, but couldn’t read words or music, even though she was a famous pianist. People with “object agnosia” can’t recognize common objects like their own car, even though their visual acuity is normal. Sacks himself has “prosopognosia,” the inability to recognize faces. People with “deep blindness” lose even their interior mental images. The Road to Emmaus by Gisele Bauche. 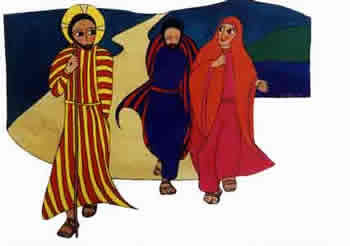 The two disciples on the road to Emmaus suffered from blindness. They talked about Jesus, recalling who he was and what he had done the preceding three years. They even talked to Jesus, who walked with them for seven miles from Jerusalem to Emmaus. Nonetheless, “their eyes were prevented from recognizing him” (Luke 24:16, NASB). They thought that Jesus was a political liberator (24:21), clueless that in him God had “reconciled to himself all things, whether things on earth or things in heaven, all things visible or invisible, whether thrones or powers or rulers or authorities” (Colossians 1:16–20). The Emmaus disciples were blinded by their mistaken expectations about what God was doing in Jesus. The relentless and powerful lies of culture blind us to God’s presence. Our family of origin shapes us in ways known and unknown, both good and bad. Geography shapes us by the power of place, and church by appeals to divine authority. 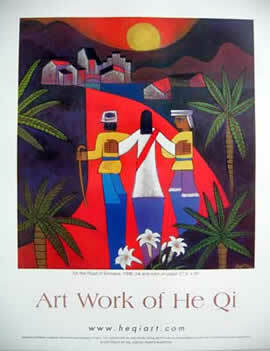 The Road to Emmaus by He Qi. 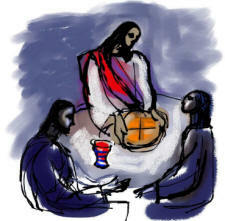 The Emmaus story is a eucharist story. Luke 24:30 says that Jesus “took bread, gave thanks, broke it, and began to give it to them.” These words are identical to all three accounts of the Last Supper (Matthew 26:26 = Mark 14:23 = Luke 22:19). It was precisely when Jesus “broke the bread” that “their eyes were opened” (24:31), a detail that Luke repeats a second time: “Then the two told [the other disciples] what had happened on the way, and how Jesus was recognized by him when he broke the bread” (24:35 ). In her memoir Take this Bread (2007), Sara Miles describes herself as a blue-state, secular intellectual, a lesbian, and a left-wing journalist who had developed habits of deep scepticism from covering revolutionary movements in Central America. Her parents were actively hostile to religion. But about ten years ago, Miles walked into Saint Gregory Episcopal Church in San Francisco, partook of the eucharist, and experienced a radical conversion. Before then she had never heard a gospel reading, never said the Lord’s Prayer, and knew only one person who went to church. Today she is on staff at Saint Gregory, and author of a follow-up memoir: Jesus Freak; Feeding, Healing, Raising the Dead (2010). Some of our blind spots are funny and forgivable, but many others are tragic. Not every blindness experiences a cure. In the documentary film Blind Spot (2002), Traudl Junge describes how when she was twenty-two years old, she was chosen “by complete coincidence and chance” from a typing competition to become Hitler’s secretary. Late in life she became deeply disturbed that she had participated in the Nazi horrors at such close quarters and remained so apolitical. In a painful catharsis of self-analysis, she describes her “blind spot” at remaining so oblivious to the obvious. Clearly wanting to unburden herself and to speak publicly for the first time in her life, the movie was taken from ten hours of interviews that Junge gave at the age of 81, just months before she died. The Greek word eucharisto means “to give thanks.” This is what Jesus did in the first last supper: “He took bread, gave thanks, broke it, and began to give it to them.” And thanksgiving is precisely what Paul remembers and recommends to us: “When he had given thanks” (1 Cor. 11:23–24). In the ancient and apostolic act of the eucharist we thank God for his presence in the bread and wine. We thank God for his mighty acts throughout history, for his culminating act in Jesus, and for his ongoing acts in our own lives today. We break the bread for our own brokenness, and thank God for our neighbor who is making the same confession right beside us, for it is my neighbor who can encourage me in my brokenness and help me to identify my blind spots. Luke ends his story with good news. When the disciples started Sunday morning on their journey to Emmaus, “their eyes were prevented from recognizing Jesus ” (24:16). The day ended with a eucharistic dinner when “their eyes were opened and they recognized him” (24:31, 35 ). May it be so for us today. Image credits: (1) Gisele Bauche: Iconography and Beyond University; (2) HeQiGallery.com; and (3) Wellsprings.org.uk. And may we open our eyes and see who Christ is every day of our lives.